The Richardson Olmsted Campus is famous for its two towers and castle-like exterior. Part of what makes the Richardson’s exterior so distinctive is the red Medina sandstone chosen by architect Henry Hobson Richardson. Medina sandstone was discovered in nearby Medina, NY in the 1820s and the first commercial quarry opened in 1837. Medina sandstone is unusually hard for a sandstone, but is easier to work with than harder limestone. In addition, the stone was available in a variety of colors, including red, grey, and brown, quickly making it a versatile and popular choice for architects and builders. With the completion of the Erie Canal, Medina sandstone could be transported across the country and abroad to be used for homes, churches, civic buildings, and even roads. Most famously, the stone was used on the face of Buckingham Palace and on the Brooklyn Bridge. The Richardson Olmsted Campus, built in the 1870s, used reddish-brown Medina sandstone quarried from Hulburton in Orleans County, New York. The former Buffalo State Hospital was conveniently sited just off Scajaquada Creek, making the transportation of the heavy stone via the Erie Canal relatively easy. With its ragged, rough surface, the exterior of the building might look like the builders didn’t finish the stone, but this look was actually intentional. The sandstone was purposefully carved in a rusticated, or rough, style that added to the hospital’s imposing stature. Architect H.H. 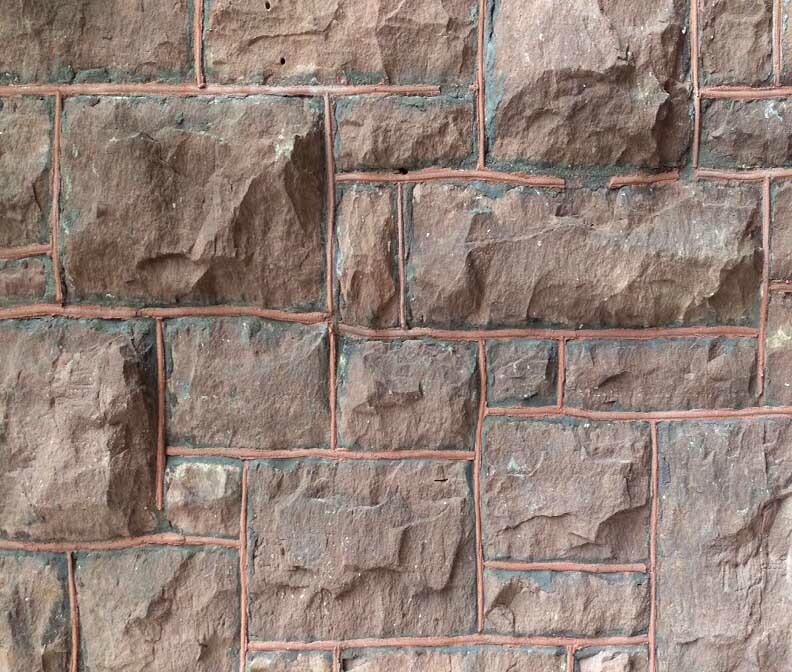 Richardson would continue to use this rusticated sandstone in future projects, including the New York State Capitol. The rough exterior of the Richardson. The overall effect of the building was made more dramatic by using a reddish iron-oxide mortar, called pointing, between the stone joints. Typically, white or grey pointing would be inserted between the stones to create an indented effect. Instead, the Richardson Olmsted Campus features unusual red mortar pointing raised up between the stones, highlighting the color and creating a distinctive pattern. The original red pointing revealed in the new North Entry. In the 145 years since construction, most of the red iron-oxide mortar was replaced with grey pointing. However, during construction of the Richardson's glass North Entry, original red mortar was revealed hiding beneath a 1920s-era addition. 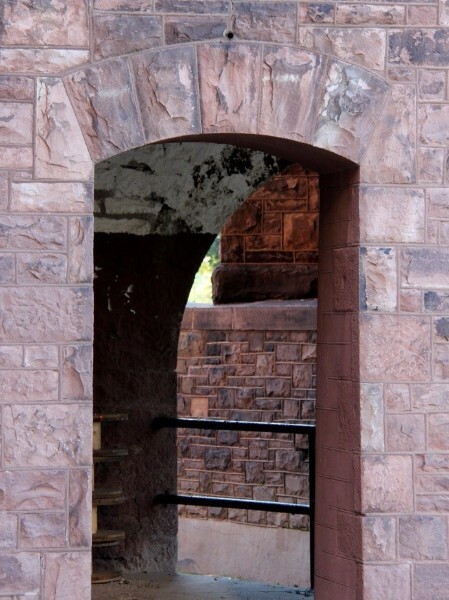 Today’s visitors can now see the original red mortar and feel the rough Medina sandstone up-close inside the North Entry. The original red pointing was later replaced by grey pointing. In 2013, the Richardson Olmsted Campus was honored in the inaugural class of the Medina Sandstone Hall of Fame for its extraordinary façade. 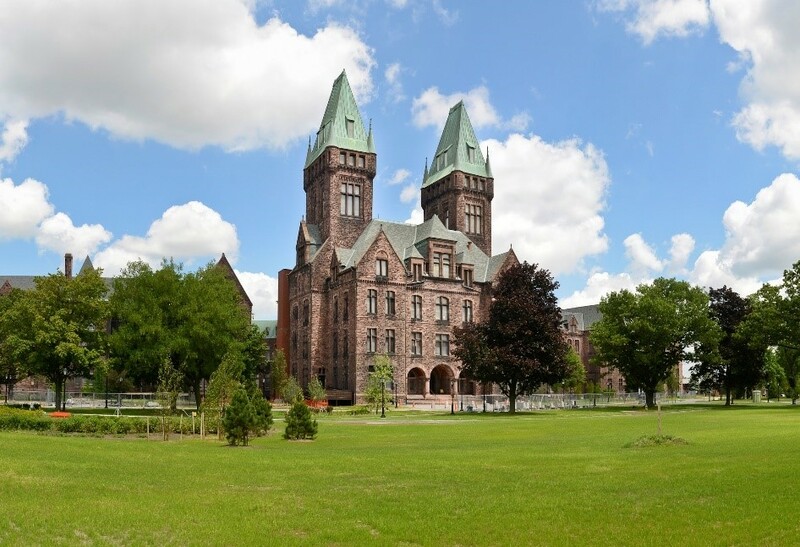 And year, with the opening of Hotel Henry and the Lipsey Buffalo Architecture Center, visitors can marvel and enjoy these magnificent sandstone structures anew. 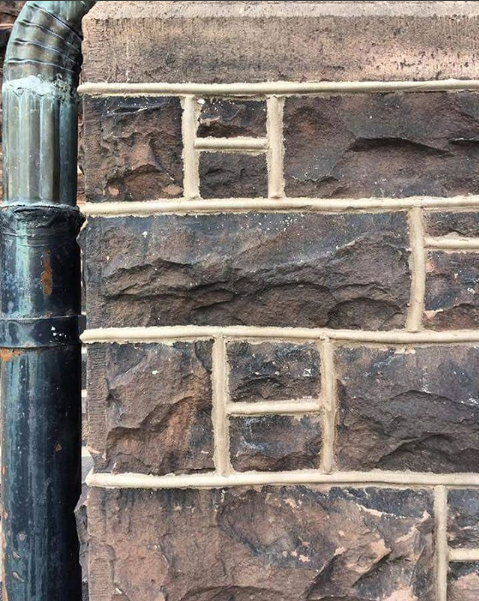 While three Medina sandstone buildings on-site were stabilized and restored as part of recent redevelopment, there are still many more buildings, and a lot more sandstone, that needs to be saved. Donate today to protect and preserve the Medina sandstone exterior of the Richardson Olmsted Campus.